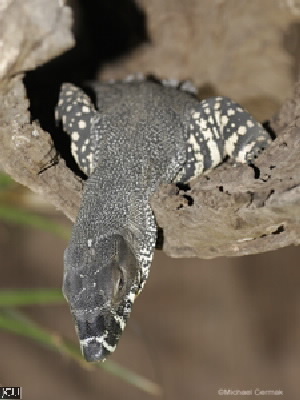 This goanna is found in both sclerophyll and woodland communities where it forages on the ground for whatever it can find. Will climb if necessary. Distinguished by the grey to black body with yellowish bands and spots, broad bands present on distal part of tail. There are some black bands on the chin.